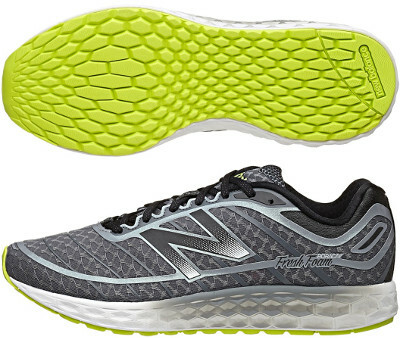 New Balance Fresh Foam Boracay are neutral cushioned running shoes. The New Balance Fresh Foam Boracay (also known as 980 v2) is the most cushioned model among Fresh Foam collection. While the Fresh Foam Zante is lighter and more responsive, the Boracay features just 4 mm drop and plush cushioning for softer transition targeting neutral runners who enjoy long distances. First edition of the 980 Fresh Foam was actually a firmer shoe than what New Balance announced and therefore current update looks for more flexibility and softer (not mushy) cushioning. Upper has been updated with seamless breathable air mesh with fused synthetic overlays (FantomFit) strategically placed for better fit. Most interesting part of the Fresh Foam Boracay is definitely the one piece Fresh Foam midsole foam. The optimal balance between cushioning and stability comes from how the hexagonal construction has been designed for related area featuring a smoother transition. New outsole still provides full ground contact and increases flexibility with redesigned (elongated) lugs.